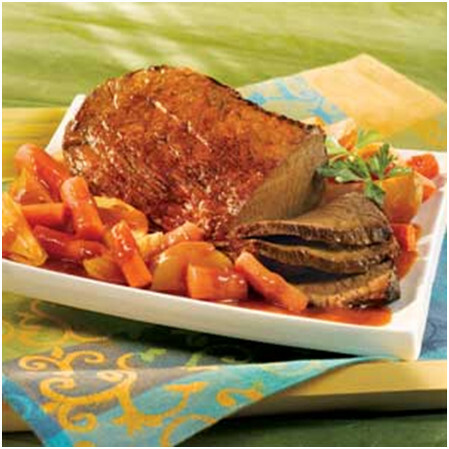 Indulge in a heavenly roast with vibrant vegetables and smothered in a rich tomato sauce. Heat the oil in a large saucepan over medium-high heat. Add the beef and cook until it’s well browned on all sides. Drain any excess fat. Stir 415ml V8 Juice, garlic powder and black pepper in the saucepan and heat to a boil. Reduce the heat to low. Cover and cook for 1 hour 45 minutes. Add the potatoes, carrots and onions. Cover and cook for a further 45 minutes or until the beef is tender. Remove the pot-roast beef and vegetables to a platter. Stir the flour and remaining vegetable juice in a small bowl until the mixture is smooth. Add to a small saucepan & stir. Increase the heat to medium-high then cook & stir until the mixture boils and thickens. Serve with the beef and vegetables.